My last post about Chipotle got me thinking about other businesses in Oxford that are taking green initiatives. Some places (other than Chipotle) that came to mind were The Green Door, Kofenya, and SOHI. I’m sure many of you readers have seen these companies environmental responsibility in action, but for those of you who may not, I would like to go into a little detail about how to have a “green” Uptown experience. To start off, according to their Facebook page, The Green Door is an environmentally conscious store that specializes in bohemian style jewelry custom made with “components from Africa, the Golden Triangle area of Asia, and Bohemia (currently called The Czech Republic).” Therefore, if you are looking to be a socially conscious consumer and need to purchase a gift (whether for a friend or maybe just yourself), perhaps you could buy something at The Green Door. Then, if you’re hungry, I encourage you to stop at SOHI (or Chipotle—read my last blog), to get a fresh handcrafted sandwich! 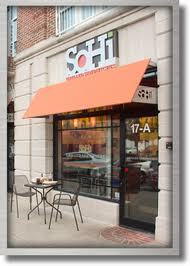 SOHI uses recycled materials in their construction and design to create a modern and green feel in their restaurant. They also have separate bins for recycling and trash in order to decrease landfill waste. After your meal, if you’re looking for a pick-me-up absolutely go to Kofenya, where you can drink your coffee in an actual mug (and therefore not create additional waste), and just enjoy the atmosphere of a local coffee shop. Overall, anything that you purchase or eat locally has some element of sustainability, simply because you’re supporting your local economy. However, if you’re looking for places that are taking an additional initiative then I encourage you to visit The Green Door, SOHI, and Kofenya—and maybe enjoy a “greener” afternoon Uptown.